I’m transitioning from an independent software developer to a new role as a small cog in a very large machine who’s intent is to digitize India. As every day flies by, the sights and sounds I see change dramatically. I’ve been keeping an eye out for games that have successfully managed to compress vast timelines into gameplay experiences. Spore is one such game. In the game, you’re introduced to a world in the first person as a single-celled organism who’s species evolves with time. With each evolutionary cycle you can introduce mutations in your species’ gene code to better match the environment you’re playing in. When playing with a concept such as evolution, the gameplay experience has to balance what’s happening now with long term goals that might not be directly apparent. Focus too much on survival and the game risks a common experience. Defocus and you’ll miss engaging the user entirely. Spore’s gameplay designers have cleverly placed easter eggs that subtly motivate the player through the game. 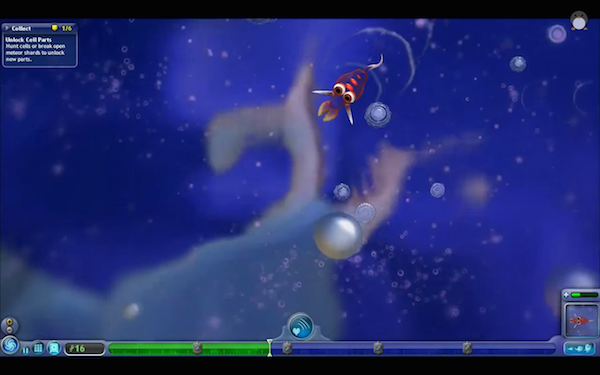 In the screengrabs below the player’s focus is on his survival in a sludge pool filled with potential opportunities and threats. 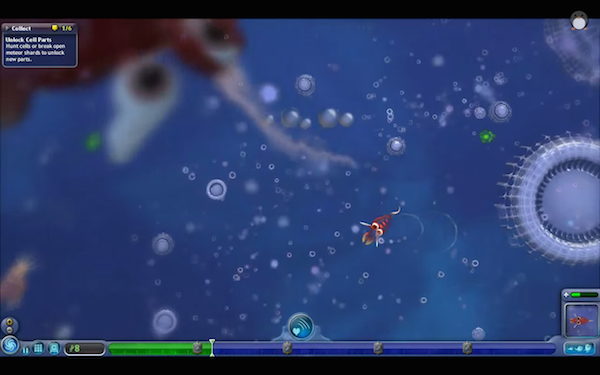 In the background you’ll spot large multi-celled organisms that indicate what the player could evolve into.